Roger Federer got off to the perfect start, speeding through the first set against Gilles Simon, even hitting the shot of the tournament with a forehand whipping around the net post. The Swiss pushed to break for the first set, eventually breaking the Frenchman for the third time on his sixth set point. When play stayed on serve in the second set, Federer took a fall, and the match quickly turned in favor of Simon. The Frenchman broke, evened the match, and then leaped ahead two sets to one. The crowd on court Philippe Chatrier were stunned and fans everywhere felt this could be the end of the Swiss maestro’s grand slam quarterfinal streak. The fourth set, and match, proved otherwise. Federer regrouped early, breaking Simon to take command and swing the momentum back on his side. He pushed to break late in the fourth set, taking this match to the distance. Although he then jumped out to a 3-0 lead, the gap was only one break, and the drama peaked when Federer served out the match. The Frenchman saved a pair of match points. The Swiss saved a pair break points with clutch serving, and managed to serve it out, 6-1 4-6 2-6 6-2 6-3. It was a relatively short five setter, just shy of 3 hours. The win is a historic one for Federer. It is the 900th win of his career, and marks his 36th consecutive grand slam quarterfinal. Further, it ties him with Guillermo Vilas for all time wins at Roland Garros (58). 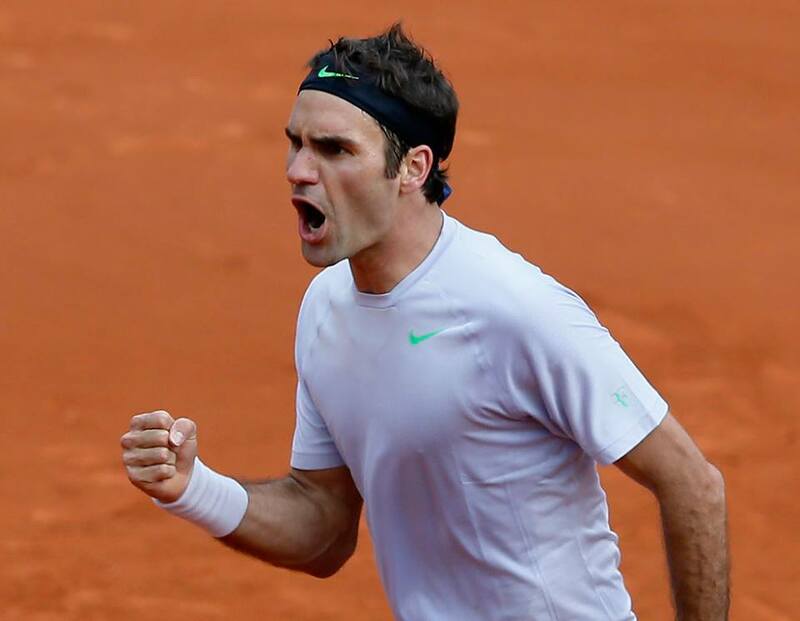 Federer will face Tsonga next in the quarterfinals on Tuesday. Roger Federer’s around the net-post “banana” shot. Roger Federer slipped during second the second set. Click here to watch. Highlights (via official Roland Garros website). Click *here* to watch. Press conference (via official Roland Garros website). Click *here* to watch. Watch full coverage of Roland Garros 2013 (French Open) on FF07tv. View the full draw *here*. See Roger Federer’s Nike outfit *here*.